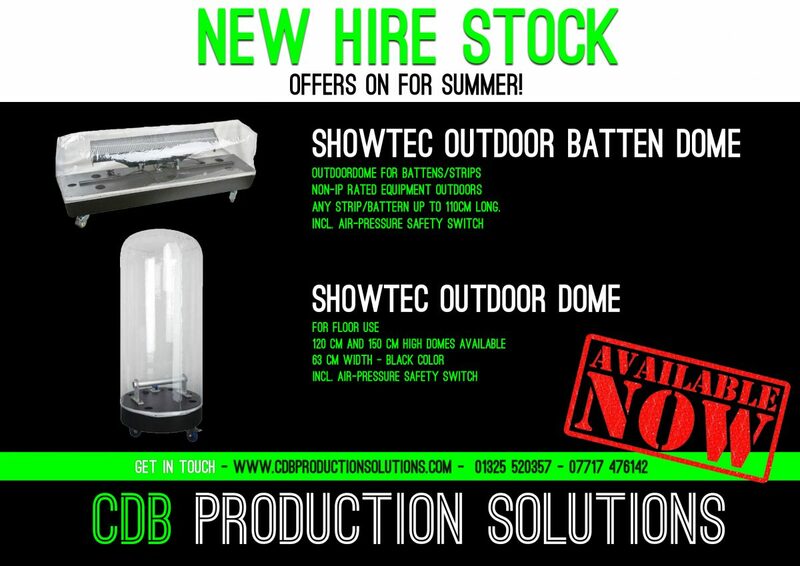 Here at CDB Production Solutions we are constantly adding to and upgrading our hire stock. We have just taken delivery of both the moving head style Showtec Waterproof Outdoor Lighting Dome and the Batten 1m Strip style Showtec Waterproof Outdoor Lighting Dome XL. The Showtec Waterproof Outdoor lighting Dome is a self inflating outdoor waterproof protection housing. Due to its waterproof cover, it allows outdoor use of various spotlights, moving heads, battens and any other fixture with a maximum lamp power of HMI/MSR 575, power supply 230V/50Hz. The Showtec Waterproof Outdoor Lighting Dome fully protects from any weather condition including against rain, snow and dirt. Through the continuous air circulation in the Showtec Waterproof Outdoor Lighting Dome, the lighting fixture also has the additional benefit from extra cooling. Very competitive pricing, with current offers on. Whatever your event, big or small, call 01325 520357 to discuss your requirements. Alternatively leave us your details on our contact form and we will call you back. Let CDB Production Solutions build your ideal event with our years of experience in sound, lighting and technical knowledge. We look forward to working with you to achieve your total production solution!